If the NextGen Custom Fields plugin has not been installed, that is the first thing that you need to do. NextGen Gallery must already be installed and you must already have galleries set-up. Since we are using albums in this tutorial, you should have an album set up as well. Install and activate NextGen Custom Fields. Put the following URL in the address bar in your web browser. http://www.example.com/wp-admin/admin.php?page=nextgen-gallery-custom-fields/ngg-custom-fields.php&mode=upgrade Make sure you change www.example.com to your own domain name. This seems to be a 2nd level of activation for the plugin. 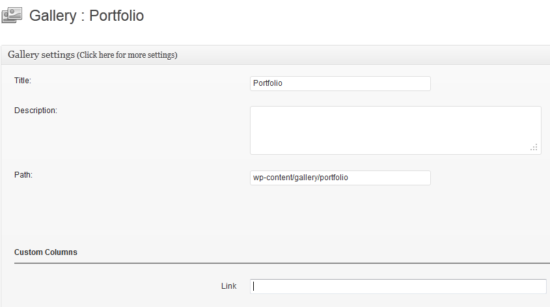 You will now have a NGG Custom Fields menu in the left navigation in the WordPress Admin below settings. Click on it. 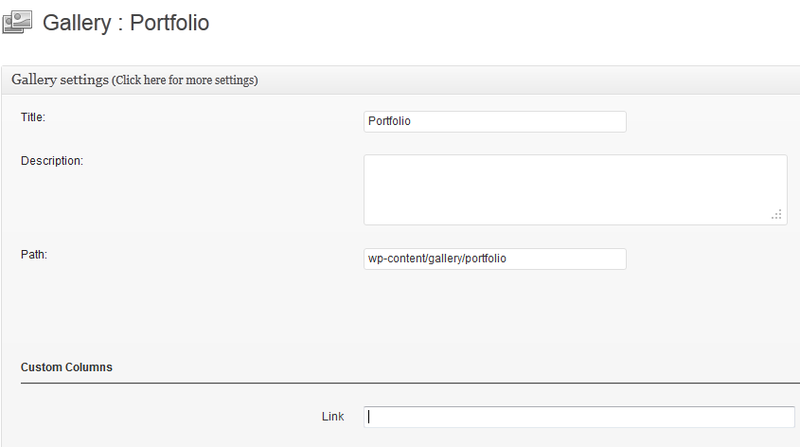 You can choose to create a custom field for individual images or for an entire gallery. Since we want to link images in an album select the 2nd choice – Gallery Custom Fields. 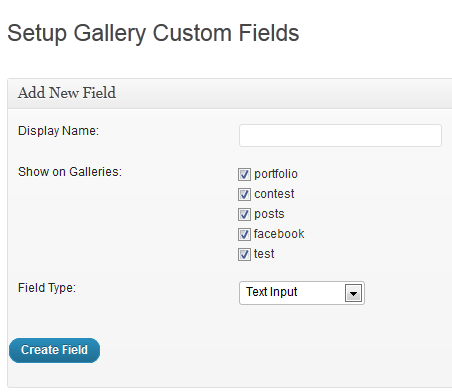 On the next screen you will want to name the custom field, which I will call Link, select the Gallery in which you will be using it and chose the type of field. Text will almost always be fine for the type of field. 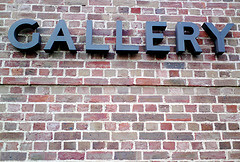 Go to the Gallery that you added the new field to under Gallery > Manage Gallery > Click on the name of the Gallery. There will be a new field area called Custom Columns before the list of images in the Gallery and it will have the name of the field next to the input area. The URL added to this field will be where the gallery image in an album will link to. Using my earlier instructions, each image in a gallery can also link to a specific location. Look for the following block of code. If you called the new field that you create in NextGen Custom Fields something other than link change “Link” in the above code to the name of your field. There are two locations that it needs to be changed. In order to update NextGen Gallery in the future and not lose these customizations, please follow the instructions in my article, How to Upgrade NextGen Gallery for WordPress Without Losing Customizations. If you would like to hire me to assist with your NextGen Gallery customizations, please contact me for a quote. Wow.. Amazing information! I would like to share this post to facebook and twitter also. I am hitting a wall!! 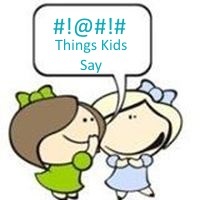 I am using the next gen gallery plugin and I am trying to make the captions on the lightbox image link to a specific post (every image has a different post). I was told that this was do-able however I cannot get it to work. It seems when I try to link the caption the lightbox times out or doesnt open. When I use this custom fields plugin it disables the lightbox functionality. Is there any way to add a link and still have lightbox functionality? Its just interesting to hear how to link images from the NextGen. Thank you for your post.. In step no 8 above, I don’t see the file nextgen-gallery/view/gallery.php under the specified path. I’m new to word press. Can you please guide me? It seems that a lot of people are having trouble with the new version of NextGen. So much so, that I’m not going to test this yet. When I do, I will write a new post. It is best to use the 1.9.3 version for now.